Jab sab milkar denge zor. The resonating slogans of Swach Bharat or Clean India will come from dream to reality only when we will work for it collectively. The problem of sanitation and proper hygiene is one of the biggest problems of the country responsible for high Infant Mortality Rate and Child Mortality Rate and it stands much higher in the ladder if we talk about the most neglected problems of the country. The reason behind its rise is our ignorance about this issue. We in cities enjoys luxurious lives. Whether its attending nature's call in the morning, bathing, cleaning our homes, washing clothes and utensils or using dust bins for our wastes they all has became our routine. We are at so much at ease with this routine that we can perform these activities even with our eyes closed. But a large part of our population is deprived of such basic facilities of sanitation and hygiene. Due to lack of toilets, they are forced to defecate in open and due to dirty surroundings washing clothes and utensils becomes just a formality and of no use. Open defecation also compromises safety and dignity of girls and women. Poor financial condition restricts them to buy dustbins,soaps and other sanitary products required for cleansing of their homes and for themselves. Their are also some parts which don't even know about the existence of such products. 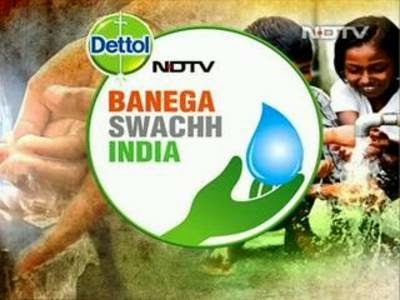 Banega Swach India an initiative by RB and NDTV is working in this direction of empowering such people with these basic facilities and requisite knowledge for cleanliness. This five year plan aims at creating awareness about sanitation and hygiene in various parts of the country by making toilets, providing clean water and by teaching the importance of cleanliness in maintaining a healthy home. A day long event 'Cleanathon' for the same is also organised on 14th December 2014 on NDTV network's news channels. Dettol Banega Swach India's campaign ambassador Mr. Amitabh Bachchan will host the event and various other personalities from the field of cinema,politics,sports,business will also participate in this campaign to bring together entire nation for better sanitation and hygiene. An India with proper knowledge of cleanliness of self and its surrounding would be much healthier and much prosperous than India which is deficient of this. Cleanliness leads to healthiness which means less medical expenditure in clinics ,medical stores and hospitals which further means prosperity. A diseased nation cannot develop in any way, diarrhea,cholera,typhoid and other such diseases prevent children from going to school. Many children died due to such ailments. The two major things health and education responsible for a developed nation losing to mere cleanliness only due to our unawareness and negligence. Why not use this public money in prevention of dirtiness related problems which otherwise used in curing of diseases related to uncleanliness. As they say that charity begins at home. The time of blame game is over. Its time that each one of us should take the responsibility of making India clean and hygienic. We must learn and teach how to wash hands properly, how to clean our surroundings and how to dispose off our garbage and wastes. Be part of this initiative. Jab milkar aage badega India, tabhi to banega swachh India. shauchalayon ke upyog se swach banega India saara. Na hi bimari se ghar baithega koi bachcha daubara. This post is part of Swach India campaign byDettol NDTV Banega Swach India in association of Indiblogger. Open defecation is a challenge & shame. Also, good health means lower medical costs. Our economy can benefit. Valid points, Cifar. Hope we have a #SwachhIndia soon.